I.T.S Dental College, Greater Noida celebrated Cultural event, FUNTAKSHARI on 23rd March 2018, Friday. The event was organized by the cultural event co-ordinator; Dr. Amit Gupta and Dr. Moulshree Kohli. The event commenced at 1:30 pm in Vivekananda Auditorium with great gusto and pomp and concluded by 3:30pm. Such cultural programs are done on a regular basis for the holistic development of the personality of the students where we inculcate team spirit, creativity and leadership qualities. It also relieves students from their hectic academic schedule and acts as a stress buster. The Friday Activity Program was presided by Director - Principal, Prof. (Dr.) Akshay Bhargava and Dr. Sachit Anand Arora (Dean UG Program). The program was attended by all Dental & Medical HOD’s, faculty members and students. Dr. Akshay Bhargava welcomed the gathering and insisted on mass participation in such cultural events. He commented that the participants (all batches) showed an astounding performance. He said that these events are organized to provide a vibrant atmosphere and decrease the stress level in the life of students and also give them chance to build a team spirit. He encouraged the students to whole heartedly participate & make this event a grand success. The event was Antakshari with a twist, involving amalgamation of many other facets of musical competition within it such as Audio round, Visual round, word round, Dumb Charades and rapid-fire round. The event started with 15 teams squaring off against one another. The participants included undergraduate students from all the ongoing batches of BDS. The students actively participated in the event with fantastic performances. It was a tough competition and the performance level was superlative. After a competent show by the students following were the winners in the event. The Event was followed by the prize distribution ceremony for the Intra-College Funtakshari and the winners were felicitated with certificates. With pulsating ambience, flashing lights and foot tapping music, the event ended with a blast, joy and happiness which could be seen in every student’s face and with lots of bon homice between the HOD’s, faculty members and students. The ‘World Oral Health Day’ was observed in I.T.S Dental College, Hospital and Research Centre, Greater Noida on 20th March 2018. The event was organized by the Department of Periodontics at Vidya Auditorium. Dr. Shivjot Chinha(Prof., Department of Periodontics), addressed the gathering and gave a brief but very interesting presentation on the importance of Oral health and reflected upon its effect on systemic health. She also told the gathering that World Oral Health Day is an initiative that hopes to contribute to increasing oral diseases in their lifetime and many of them can be avoided with increased governmental, health association and society support and funding for prevention, detection and treatment program. Dr. Akshay Bhargava, Director P.G Studies shared his words of wisdom and addressed the gathering. He emphasized upon the importance of good oral health and said that normally the body's natural defenses and good oral health care, such as daily brushing and flossing, can keep the bacteria under control. However, without proper oral hygiene, bacteria can reach levels that might lead to oral and systemic infections. Dr. Sachit Anand Arora, apprised the gathering and emphasized upon role of dentist in promoting oral health. He also told that If you don't take care of your teeth and gums, your poor oral hygiene can actually lead to other systemic health problems.The talk was followed by a mind boggling quiz. Dr. Sachit Anand Arora was the quiz master in which the teams from all departments participated enthusiastically. Department of Orthodontics won the first prize in the competition and department of Oral pathology won the second position. The winning teams were awarded certificates by the dignitaries. As a part of the World Oral Health Day celebration, it was a day where the celebration echoed that Oral health is a mirror for general health. All the Dental & Medical HOD’s, other faculty members, post graduate students and interns applauded the students & faculty for observing this day and bringing awareness in the society. The event came to an end with a High Tea. Department of Oral Medicine and Radiology organized an extensive 2 day Workshop on Excellence in Facial Aesthetics Lectures & Hands-on on 16th and 17th March 2018 in lieu of the growing demand for facial rejuvenation in Vidya Auditorium of ITS Dental College, Greater Noida. Workshop commenced with an inaugural ceremony on 16th March 2018 by Director-Principal Dr.Akshay Bhargava, Dean-UG program, Dr.Sachit Anand Arora, Dr Manisha Lakhanpal Sharma, Professor & HOD, Department of Oral Medicine and Radiology. After extending a warm welcome to the august gathering, Dr Manisha Lakhanpal Sharma, introduced the resource person Dr. Shourya Sharma (founder and CEO of Indian Academy of Facial Aesthetics (IAOFE)), and Dr. Athreya Rajagopal, Maxillofacial and Facial Cosmetic Surgeon. She spoke about the growing need for facial aesthetics with innovative rejuvenating procedures in the field of dentistry. Also present on the occasion were all Dental & Medical HOD’s, other faculty members, post graduate students, interns and private practitioners. Director-principal, Dr. Akshay Bhargava addressed the delegates, post graduate students and faculty members. He emphasized on the great need of improvising facial aesthetic with Botox, Dermal Fillers and Threads in clinical practice. After the inaugural ceremony, Dr. Shourya Sharma and Dr. Athreya Rajagopal delivered comprehensive, evidence based lectures on aesthetic and therapeutic facets of Botox, Fillers and Threads. Soon after the lectures, delegates were given hands-on on various facial aesthetic procedures using Botox on patients having indication of Crow Lines, Forehead Lines, Masseter Muscle Hypertrophy, TMD’s and Gummy Smile. Hands-on was followed by lunch and further by an exclusive lecture on Dermal Fillers by Dr. Athreya Rajagopal, after which Day 1 of the workshop came to an end. As per the delegates it was a great experience for them working with Botox. Second day (17th March 2018), commenced with lectures by Dr. Shourya Sharma and Dr. Athreya Rajagopal, which were then followed by Hands-on on various facial aesthetic procedures using Dermal Fillers for Black Triangles, PRP for hair rejuvenation and Dermal Threads for face lift. Day 2 came to an end with a valedictory function wherein the felicitation of the resource persons was done by Dr. Akshay Bhargava and Dr. Sachit Anand Arora and participation certificates were given to delegates. The feedback by the delegates was encouraging. The enthusiasm in faculty and students could be easily palpable by one and all. The event was followed by lunch for the dignitaries and delegates. The event was academically gratifying and a great learning experience. 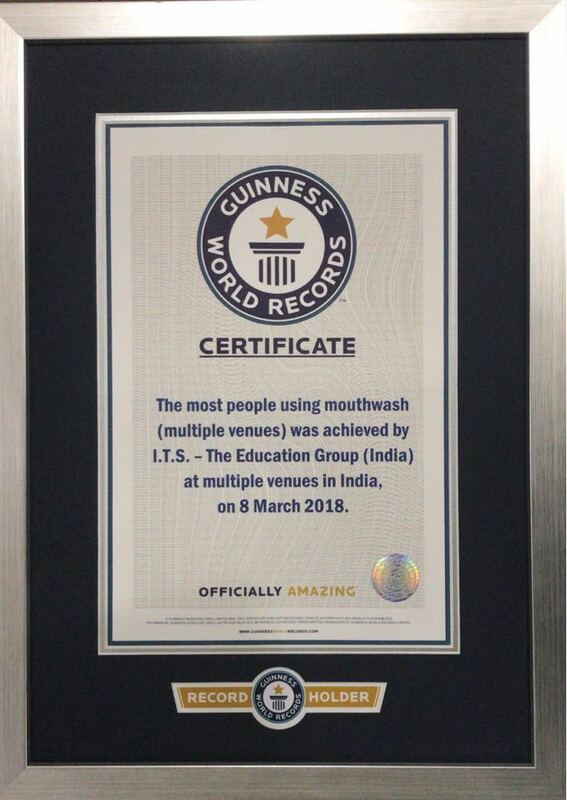 I.T.S - The Education Group entered its Name in Guinness world record for “Maximum people using Mouthwash at same time in multiple venues” on 08.03.2018. I.T.S Education group is known for its endeavor to provide oral hygiene care and spreading awareness regarding oral hygiene for masses by organizing various camps and awareness program under the guidance of honorable Chairman, I.T.S- The Education Group - Dr. R. P. Chadha, Vice Chairman – Mr. Sohil Chadha, Secretary – Mr B.K.Arora; Director-Principal Dr.Akshay Bhargava, Dean-UG program Dr.Sachit Anand Arora. On 08.03.2018 I.T.S education group organized a unique event with the motive of spreading awareness regarding oral hygiene using mouth wash at large scale in multiple venues. In this event more than 4000 volunteers participated and used mouthwash at the same time under the guidance of the faculty members I.T.S Dental Colleges. Vice Chairman, Mr Sohil Chadha said its attempt of I.T.S – The Education Group to create awareness about oral health among the masses through various programs. He told this event was done to create weakness among the general population regarding the beneficial effects of mouthwash among the people. He complimented the team for their successful attempt for recording the name of I.T.S – The Education Group in Guinness World Record. Secretary, Mr B.K Arora congratulated the team led by Director- Principal, Dr Akshay Bhargava, Dean UG Prog- Dr Sachit Anand Arora, Director Engineering Dr Vikas & Dean Engineering- Mr Gagan Deep for the success. He said "Record breaking is about pushing the boundaries. You didn't just break the existing record, you smashed it,"
The event was held simultaneously in all three Campuses of I.T.S- The Education Group (viz- Mohan Nagar, Muradnagar & Greater Noida). The volunteers gathered in the campus and after registration they were given pre bar-coded bands. They assembled in the lawns under the guidance of Stewards, Time keepers and judges of other Institutes. The event was synchronised in all three Institutes at same time wherein the participants swished the mouthwash in mouth for 25 seconds and spit it out. The participants were dancing t the tunes of the music played by DJ. The stage was managed by Dr Akshay Bhargava, Dr Sachit Anand Arora & Dr Manisha Lakhanpal who told about the importance of the event and mouthwash to all present. Director-Principal, Dr Akshay Bhargava said that mouthwash is an effective tool in fighting against tooth decay, gingivitis as well as the promotion of healthy teeth and gums. In 1914, Listerine was marked as an oral germ killer. It has proven antiseptic agent and helps to reduce the bacterial growth by 99% when used twice daily for 25-30 sec, mouthwash provides 24 hrs germs protection. He told it’s our aim to motivate and educate the people about the various methods of maintaining oral hygiene. Dean UG Prog- Dr Sachit Anand Arora told that idea to take out the mammoth campaign came to them four to five months ago and the team had been working for three months to make it a reality. Members of the faculty and management of I.T.S – The Education Group cheered as they qualified for the Guinness Record “The Most People Using Mouthwash (Multiple Venues) Simultaneously” on 08.03.2018. I.T.S Dental College, Greater Noida held its Annual Convocation Ceremony on 23rd February 2018 for the third batch of M.D.S and outgoing B.D.S 2012 batch on completion of their course. On this occasion, the function was organized to confer degrees to the Graduate and Postgraduate students. This day would be etched forever in the history of I.T.S Dental College, Greater Noida as it hosted Dr. D.S. Chauhan, Vice Chairman, GLA University, Mathura, as the Chief Guest. Sh. Dinesh Rai, IAS (Retd), Chairman Warehouse Development & Regulatory Authority and Dr. Harsh Jauhari, Chairman, Dept of Renal Transplant Surgery, Sir Ganga Ram Hospital, Delhi graced the occasion as the Guest of Honor. Chairman, I.T.S- The Education Group, Dr. R. P. Chadha; Vice Chairman, Mr.Sohil Chadha; Secretary, Mr B.K. Arora; the Director Public Relations, Mr. Surender Sood; Director-Principal – Prof. Akshay Bhargava; Dean UG Program, Dr. Sachit Anand Arora, faculty members and parents of the students were present on this solemn occasion to motivate the students to find their path and excel in the future. The function started with the academic procession which was led by (Major Gen.) Dr G.K Thapliyal, followed by the Dignitaries and all Heads of Departments. Dr. D.S. Chauhan in his convocation address spoke about the fine quality of education being rendered by the Institution. He said that today I.T.S- The Education Group has emerged as leading name in the education especially for training high class dental surgeons. Also, in his message he spoke about the importance of doctors in the lives of common people. Hecomplimented on the work done by the Institution for the poor and needy people. He told that graduation is just a phrase: whereas we graduate daily by learning new things in our life each and every day. He also congratulated the hard work put in by the students, teachers and their parents towards achieving this milestone in life. Sh. Dinesh Rai in his address told the students that it is of utmost importance to always keep updating their existing knowledge. He said that students will although pass out from the institute today, however, they should never think twice before asking from their teachers on any matter. He also emphasized the importance and respect that the dental profession has in the real world and asked students to take up their career wisely. He told that “RESEARCH IS CREATING KNOWLEDGE”, Research leads to an expansion of knowledge and discoveries of new medical treatments and cures. He emphasized that Research is the only solution to any problem in the medical field and well-conducted research is vital to the success of global heath endeavors. Dr. Harsh Jauhari in his address told that that advances in health information technology are enabling a transformation in health research that could facilitate studies that were not feasible in the past, and thus lead to new insights regarding health and disease. He told that the main aim of opening this lab is to create insight among the students for research so that they can find newer methods of diagnostic techniques and natural products which will be helpful in treating the patients.He emphasized that the education received by all graduating students should be used for welfare of the society and growth of the nation. Director- Principal, Dr Akshay Bhargava, in his annual report of the college praised the achievements of the faculty and the students. He told that we had international fellowships awarded to our faculty, from international digital dentistry for smile design, Dr. Amrita, Dr. Ruchika and Dr. Meera. He told that maintaining the academic standards of the Institute students continued to secure university positions at various levels. Farookh Masoodi from 1st year BDS secured the 1st university rank, Rhythm Batra from 2nd year secured the 2 university rank, Aayushi Sangal from BDS 3rd year secured the 1st university rank and Palak Jain from BDS final year secured the 1st university rank. He said that the education provided to the students by the Institute should be used not just to earn money but to serve needy people with dedication and commitment. He also, pointed out the attributes of a successful doctor, encouraged all students to pave their path of success honestly and take pride in passing out from such a prestigious institution. He emphasised that an institution is like a mother to the students and these memories remain etched in minds of the students. He gave his blessings on this occasion to both the postgraduate and the undergraduate batch. On this occasion Dr. Sachit Anand Arora enlightened upon the ethical essence of a doctor towards the society and conducted an inevitable Oath Taking ceremony to the undergraduate batch. The Chief Guest and the Guest of Honour conferred the B.D.S & M.D.S Degrees to the outgoing students. The Best Outgoing Student Awards for academics, All-rounder and extracurricular activities and sports were awarded to Best Outgoing Student (Academics) Meenu Parihar, Best Outgoing student Rakesh Medhi (All rounder), Best Outgoing student(All rounder)Vishakh Saraf, Best Outgoing student (Extra Curricular Activities)Tushar Sharma. Awardwas also conferred for the Best Outgoing Post Graduate students Dr. Sugandha Marwahain academic excellence. On this occasion, the ‘Yearbook’ compiled by the students of the 2012 batch under the stupendous guidance of Dr. Sachit Anand Arora, depicting their precious and special memories of five years in the institution was released by the dignitaries. The programme concluded with the vote of thanks proposed by Dr Anil Chandna, Vice Principal. The extensive and pronounced efforts by Dr.Sachit Anand Arora led to the successful completion of the Annual Convocation Ceremony. At the closure of the ceremony, the students, along with their teachers and parents proceeded for lunchwherein they discussed their everlasting respect for this institution and teachers and their precious moments spent in the campus. Thereafter, the students left the institution with blessings from their teachers, tears in their eyes and ambitions in their mind and love for the institution in the heart. I.T.S Dental College, Greater Noida celebrated the International Oral & Maxillofacial Surgeons’ Day on 13th February 2018. The program was organized by the Department of Oral & Maxillofacial Surgery, at Vidya Hall from 9:00 am to 10:30 pm. The distinguished Guests for the occasion were Col. P.K. Chatopadhaya, Senior Advisor OMFS, ADC (R&R) Army Hospital; Dr.Athreya Rajagopal, Maxillofacial & Facial Cosmetic Surgeon, Sant Parmanand Hospital, Delhi & Dr.Gaurav Sharma, Consultant Maxillofacial Surgeon, Ramakrishna Mission Hospital. Also present on the occasion were Director - Principal, Prof (Dr) Akshay Bhargava, all dental and medical HODs, faculty members and students. To commemorate the day, a public awareness and education campaign projecting the work done by Oral & Maxillofacial Surgeon was organized by the department. (Maj. Gen.) Dr G.K Thapliyal, Prof & Head welcomed all the invited guests & delivered an inspiring lecture to the young budding surgeons in the specialty. He said that "Initially, this branch dealt with only dental surgeries. Over the years, its domain has widened and now deals with problems from head to throat. With aid from technologies like LASER and titanium implants, the branch offers a lot of scope in the future too," his address acted as a medium to inform students about the specialty and encourage them to opt for it." Col. P.K. Chatopadhaya addressed the gathering and mentioned that he was honored to be part of the ceremony. He spoke about the scope and future of the specialty in India. He also spoke about the surgical management of sleep apnea in the patients. He discussed about the various treatment modalities available for treating Obstructive Sleep Apnea. Dr.Athreya Rajagopal in his lecture showed various cases done by him by the use of derma fillers and Botox. He inspired the budding Oral Surgeons and told that sky is the limit for them. He told that esthetics can be achieved with the help of soft tissue management and minimal invasive procedures. Dr.Gaurav Sharma shared his insights about the Hair Transplant followed by Live surgery demonstration. He told thathair transplantation is a surgical technique that removes hair follicles from one part of the body, called the 'donor site', to a bald or balding part of the body known as the 'recipient site'. He said in this minimally invasive procedure, grafts containing hair follicles that are genetically resistant to balding, (like the back of the head) are transplanted to the bald scalp. Director - Principal, Prof (Dr) Akshay Bhargava shared his words of wisdom and addressed the gathering. He told that International Oral & Maxillofacial Surgeons’ Day is celebrated to acknowledge the contributions of oral and maxillofacial surgeons to society around the world and to raise the profile of the specialty. He appraised the gathering and emphasized that the job of a dentist today has surpassed taking care of one's teeth or oral health. Whether it is dealing with patients having cancer anywhere above the neck, correcting birth defects like cleft lip or dealing with people who have incurred grave injuries on the face, one specialist who is always needed on board is an oral and maxillofacial surgeon. The event came to an end with the cake cutting ceremony.The function was followed by High Tea for the faculty members and students. I.T.S Dental College, Greater Noida observed World Cancer Day on 10th February 2018, in lieu of the World Cancer Day which is observed on 4th February every year. This day is held to commemorate the spirit of National and International organizations towards making the strategy to fight against cancer as well as distributing the real message about this epidemic disease. The Program was organized by the Department of Oral Medicine & Radiology, at Vivekananda Hall from 10:00 am to 12:00 pm. The program was presided by Dr. Sachit Anand Arora (Dean UG Program). It was attended by the Dental & Medical HODs, faculty members, undergraduate and postgraduate students and interns. Dr. Manisha Lakhanpal Sharma, HOD, Dept. of Oral Medicine & Radiology, started the program with a welcome speech which was then followed by guest lectures by eminent speakers in the field of oral cancer diagnosis. I.T.S Dental College, Greater Noida celebrated Cultural event which was organized by Cultural incharge; Dr. Amit Gupta and Dr Moulshree Kohli on 19th January 2018, Friday. The event included a Skit Competition which commenced at 2:30 pm in Vivekananda Auditorium and concluded by 4pm. Such cultural programs are done on a regular basis for the holistic development of the personality of the students where we inculcate team spirit, creativity and leadership qualities. It also relieves students from their hectic academic schedule and acts as a stress buster. The judges for the program were Dr. Manisha Lakhanpal (Professor and Head, Department of Oral Medicine & Radiology), Dr. Bhuvandeep Gupta. (Reader, Department of Public Health Dentistry). Dr. Akshay Bhargava welcomed the gathering and insisted on mass participation in such cultural events. He commented that the themes chosen by the participants (all batches) were very mature and such themes should be encouraged. Despite the sensitivity of the topics, the students addressed the same very eloquently. He said that these events are organized to provide a vibrant atmosphere and decrease the stress level in the life of students and also give them chance to build a team spirit. He encouraged the students to whole heartedly participate & make this event a grand success. The participants included undergraduate students from all the ongoing batches of BDS. The students actively participated in the event with fantastic performances. It was a tough competition and the performance level was superlative. After a competent show by the students following were the winners in the event. Current social issue and Drug addiction. The judges awarded the winners with the certificates. With pulsating ambience, flashing lights and foot tapping music, the event ended with a blast, joy and happiness which could be seen in every student’s face and with lots of bon homice between the HOD’s, faculty members and students. I.T.S Dental College, Greater Noida observed "Hepatitis Vaccination Day" on 24th Nov'17 from 1:30 to 3:30pm in the college premises. Under the aegis of Director-Principal Dr.Akshay Bhargava, Dr. Sachit Anand Arora (Dean UG Program, Prof & Head Dept. of Periodontics) organized the whole program and staff nurses, laboratory technicians and auxiliary workers coordinated and rendered the same. All the BDS and MDS students and staff members were asked about their vaccination status and encouraged to take vaccination if required. In most of these had the first dose of Hepatitis B and few had booster dose. The second and third Hepatitis B vaccination will be organized after one and six months as according to the vaccination schedule i.e., 0,1 and 6 months. The enthusiasm in faculty and students could be easily palpable by one and all. The event was clinically as well as academically gratifying. It highlighted how Hepatitis threatens the development of nation worldwide, as, present youths are the future healthcare leaders of the country. This effort to spread awareness about Hepatitis was praised by visiting patients & all staff members. Department of Pedodontics and Pediatric dentistry organized a two day interactive program “Know Nois For No Noise” from 22nd Nov. to 23rd Nov. 2017. The program was conducted in Vidya Auditorium at ITS Dental College, Greater Noida. The event was inaugurated by Director-Principal, Dr.Akshay Bhargava and Dr. Mousumi Goswami, (Prof and Head, Department of Pedodontics) with other faculty members of the department. Dr. Srinivas Nimeneni was the invited guest speaker for this program. Dr. Srinivas Nimeneni is an eminent pedodontist. He has an exclusive hospital based pediatric dentistry practice. He has delivered several lectures at national and international forums. His name features in the list of contributors in the Textbook of Nitrous oxide and Oxygen sedation by Morris S. Clark. Currently he is the President of Indian Society of Pedodontics and Preventive Dentistry. Many children undergoing minor procedures need effective sedation, or anesthesia, because they are frightened, in pain, ill, or have behavioral problems. Some procedures are very common and anesthetists should know what sedation techniques are effective and likely to be used by other healthcare practitioners. In children presenting for anesthesia, occasionally, it may be appropriate to use conscious sedation instead. Inhalational conscious sedation is a technique that uses Nitrous Oxide as an agent to calm the patient and deliver painless dental treatment. Child remains in a state of relaxation maintaining his protective reflexes during the treatment. Child who has undergone this treatment can walk away same day. This technique is gaining wide spread acceptance among Indian population. In order to enhance skills of clinicians working in the department of pediatric dentistry; a two day interactive programe was organized. This program involved a series of lectures followed by hands on program. Thirty three participants who attended the program included faculty members, post graduate students of ITS Dental College, Greater Noida & Muradnagar. First day involved a series of informative lectures elaborating the use of nitrous oxide gas, its mechanism of action, pharmacokinetics and pharmacodynamics. Technique of use, Occupational hazards and safety measures to be taken while using nitrous oxide in the machine were elaborated in great details. Second day started with an interactive session and a doubt clearing session. Participants clarified their doubts and queries regarding various aspects of conscious sedation technique which was followed by a hands-on. Hands-on started with an elaborate discussion on various parts of the machine. This was followed by live demonstration on subjects. The program gave in-depth insights into the technique. Some joyful moments were captured in the lens. This was followed by felicitation of speaker done by Dr.Akshay Bhargava and Dr. Mousumi Goswami. The enthusiasm in faculty and students could be easily palpable by one and all. The event was followed by lunch for the dignitaries and delegates. The event was academically gratifying.